There's been much to celebrate for former Kia MVP Russell Westbrook and current candidate Paul George. The Oklahoma City Thunder have often looked like the second-best team in the Western Conference. They have the West's best defense thus far, an MVP candidate, a former MVP averaging a triple-double, and a starting lineup with the league's best raw plus-minus by a wide margin. The Thunder are 13-9 against the other nine teams in the West's top 10, with wins over eight of the nine. And all nine of the losses were within five points in the last five minutes. In total, the Thunder only have three losses that weren't within five points in the last five minutes. Every other team in the league has at least twice as many. What storylines will prove key in the stretch run of the 2018-19 season? Coming out of the All-Star break, Oklahoma City looks to be comfortably top three in the West, and staying there would allow them to avoid the likely No. 1 seed Golden State Warriors until the conference finals. But before they can do that, the Thunder will have to navigate the league's toughest post-break schedule, with 17 of their 25 remaining games against teams that have winning records at the All-Star break. That includes three games against the two teams -- Denver (2) and Golden State (1) -- ahead of them in the West and another three against the top two teams -- Milwaukee (1) and Toronto (2) -- in the East. The Thunder will play 14 of their final 25 games at home, where they're 20-7. But they have twice as many games with a rest disadvantage (4) as they have with a rest advantage (2). One of those rest disadvantage games is at the end of a 5-games-in-7 days stretch from March 2-8 that includes road games against the Spurs, Blazers and Clippers. Rest advantage / Rest disadvantage: Games in which one team (at a disadvantage) played the day before and the other (at an advantage) did not. This season, teams are 129-85 (.603) with a rest advantage, 97-42 (.698) at home and 32-43 (.427) on the road. There will be no easy matchups in the Western Conference playoffs, but there will be an advantage to finishing second or third. If the Thunder can do that after playing the league's toughest post-break schedule, they will have earned it. The Warriors' remaining schedule is right in the middle of the pack in regard to the strength of the opponents, easier than those of the two teams with a chance of catching them for the No. 1 seed. They do have two stretches of five games in seven days, though one concludes with a three-game homestand against Indiana, Dallas and Detroit, while the other includes games against Cleveland (at home), New Orleans and Memphis. The Nuggets have the West's second-toughest remaining schedule, which includes 12 games against the other West teams currently in playoff position. They have two games remaining against the Warriors, Thunder, Blazers, Spurs and Jazz. Through the first nine weeks of the season, the Nuggets' defense ranked fourth in the league. It has since dropped to 13th and it will be tested down the stretch. The Nuggets have the fewest games remaining (three) against teams that currently rank in the bottom 10 in offensive efficiency, and one of those three games is in L.A. against the 21st-ranked Lakers. The Nuggets have a pretty tough 5-games-in-7-days stretch from March 28 - April 3 that begins with a road-road back-to-back in Houston and Oklahoma City. After that, they'll return home for a game against Washington and then have a road-home back-to-back against Golden State and San Antonio. Golden State vs. Denver - Series tied, 1-1. Golden State vs. Oklahoma City - Series tied, 1-1. Denver vs. Oklahoma City - Denver leads, 2-0. The schedule might allow Rudy Gobert and the Jazz to fend off their closest competitors. These teams aren't necessarily safe in regard to making or missing the playoffs. The fourth-place Blazers are just four games ahead of the ninth-place Kings. But for the sake of organization (and because the teams in sixth and seven place have easier schedules than those in fourth and fifth), we'll keep 'em separated. Interestingly, there are only two games left to play between these four teams (see below). The Blazers have the league's most road-heavy remaining schedule, with only nine of their final 25 games at the Moda Center. They begin their post-break slate with a seven-game trip - six games against the East and a finale in Memphis - that includes games at Philadelphia, Boston and Toronto. And they'll return to the Eastern time zone again in late March. 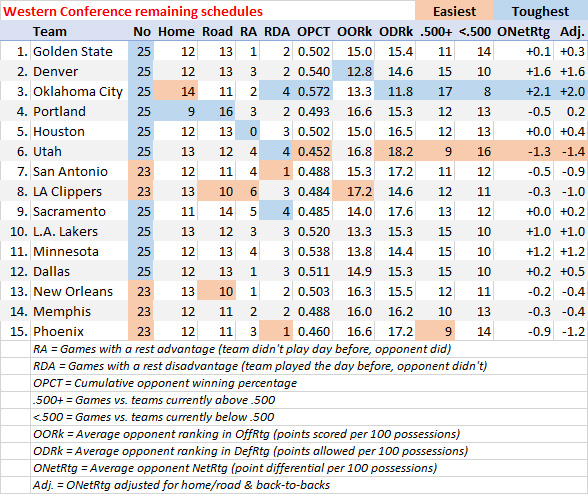 The Blazers do have a relatively easy schedule in regard to opponent strength (13 of their 25 games are against teams currently under .500) and have just two rest-disadvantage games left to play. The Rockets are the only Western Conference team that doesn't have a single rest-advantage game left on their schedule. They have just one game left against a team playing the second game of a back-to-back (Feb. 28 vs. Miami), and that's the second game of their own back-to-back. It's good to be in the middle of the country, though. While the Rockets play 13 of their final 25 games on the road, they don't have any trips longer than two games. The Jazz continue to reap the rewards of having played the league's toughest first-half schedule. They have the West's easiest remaining schedule, with a league-high 16 games against teams that currently have losing records. Their longest-remaining road trip is four games against four of the five worst teams in the Eastern Conference. They also have the fewest games remaining against teams that currently rank in the top 10 offensively (5) and the fewest games remaining against teams that rank in the top 10 defensively (4). The Spurs had an ugly start to the rodeo road trip, allowing 128.7 points per 100 possessions as they lost the first four games. But they went into the break with a win in Memphis and the post-break portion of the trip isn't as daunting. They open their post-break schedule in Toronto on Friday and then play a Sunday-Monday back-to-back against the two New York teams. Their game in Brooklyn on Monday is their only rest-disadvantage game left on their schedule, which is relatively easy in regard to opponent strength. The Spurs are the only team in the league with more games remaining against the opposite conference than they have within their own conference. Including those first three road games, they'll play 14 of their 25 games against the East. That includes six total games against the East's bottom four (two each against Atlanta, Cleveland and New York). Portland vs. Houston - Portland won, 2-1. Portland vs. Utah - Series tied, 2-2. Portland vs. San Antonio - Portland leads, 2-1. Houston vs. Utah - Series tied, 2-2. Houston vs. San Antonio - Houston leads, 2-1. Utah vs. San Antonio - Utah won, 2-1. This is where things get really interesting. We have the Los Angeles Lakers trying to end a five-year playoff drought (the longest in franchise history) and LeBron James trying to keep his personal playoff streak (13 years -- without losing in the first round) alive. And the two teams between the 10th-place Lakers and a postseason spot are a long-time rival riding a 12-year playoff drought (the Sacramento Kings) and the team with whom they share an arena (the LA Clippers). The Clippers traded their leading scorer at the deadline, but won two of their last three games before the All-Star break to hold a one-game edge over the Kings (they're tied in the loss column) for eighth place. And of the three teams, the Clips have the easiest remaining schedule. In regard to cumulative opponent winning percentage, the Clippers have the third easiest post-break schedule in the West, though 12 of their 23 remaining games are against teams that currently hold winning records. LA has five games remaining against the three worst teams in the Eastern Conference - Chicago (1), Cleveland (2) and New York (2). The Clippers also have six rest-advantage games (tied for most in the league) left on their schedule. That includes a game against the Lakers on April 5, one of three games during the final eight days of the season in which they have a rest advantage. The Kings have the most road-heavy schedule of these three teams, with 14 of their 25 remaining games away from the Golden 1 Center. They start their post-break slate by playing at Golden State on Thursday, at Oklahoma City on Saturday, and at Minnesota on Monday. They have a four-game trip that concludes a back-to-back in Boston and Philadelphia and a four-game trip that concludes with a back-to-back in Houston and San Antonio. The Lakers have the West's fourth-toughest remaining schedule in regard to cumulative opponent winning percentage, with 15 of their 25 games against teams that currently have winning records. Things aren't so tough at the start, but they finish with these five games: @ OKC, vs. GSW, @ LAC, vs. UTA, vs. POR. While people on the outside dream of a pair of Eastern Conference semifinals that include the Boston Celtics, Milwaukee Bucks, Philadelphia 76ers and Toronto Raptors, a fifth team could prevent that from even being a possibility. As the East stands now, the Celtics and Sixers would face each other in the first round, because the Indiana Pacers are in third place, having run off a six-game winning streak before losing to Milwaukee in their last game before the break. The Pacers are without Victor Oladipo for the rest of the season, but still have the league's No. 2-ranked defense and a solid starting lineup that includes the recently added Wesley Matthews. The Raptors will be done playing the other four teams in this group before we get to March. They've already played 14 of their 15 games within the group and they'll play their final game against the Celtics on Tuesday. The Bucks have a league-high five rest-disadvantage games on their schedule. Two of them are at Utah and at San Antonio, but another two are in Cleveland and home against Atlanta. They have six games remaining against the five teams that have won less than a third of their games, which should give them opportunities to rest their starters in preparation for the playoffs. The Raptors have the league's easiest remaining schedule in regard to cumulative opponent winning percentage, with just seven of their final 23 games against teams that currently have winning records. They also have just two back-to-backs (fewest in the league) left on their schedule. The Pacers have the East's second-toughest schedule in regard to cumulative opponent winning percentage, though only 12 of their 24 games are against teams that currently have winning records. They actually begin their post-break slate with seven straight games against teams currently under .500. But then they play 10-of-11 against teams currently better than .500, and they have more games remaining against the top three teams in the West -- Golden State (1), Denver (2) and Oklahoma City (2) -- than they have against the bottom four teams in the East -- Atlanta (1), Chicago (1), Cleveland (0) and New York (1). With five games left against the other teams in this group, the Celtics have the best opportunity to help themselves. And with nine games left against teams in the top 10 in the West (including six straight from March 3-14), they also could help sort things out in the other conference. 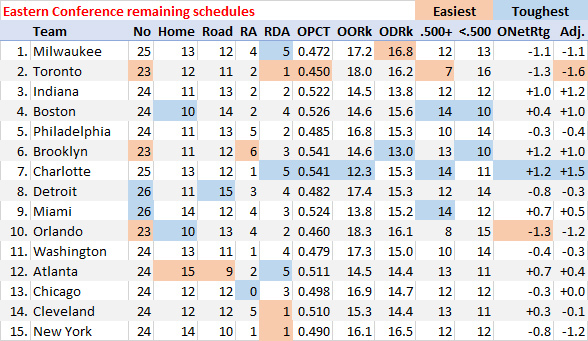 They do have the most road-heavy remaining schedule in the East, with 14 of their 24 games away from TD Garden. The Sixers have a relatively easy schedule going forward, with 14 of their final 24 games against teams currently under .500. But after playing seven of their next 11 games at home, they'll play 9-of-12 on the road (before closing the season at home against the Bulls), with two of the three home games in that stretch against the Celtics and Bucks. The return of "The Dragon" looms large in the East playoff chase. With the Washington Wizards having lost seven of their last 10 games before the break, it appears that five teams will be fighting for the final three spots in the East over the next two months. Coming out of the break, the Brooklyn Nets and Charlotte Hornets are in sixth and seventh place, respectively. But those two teams have the Eastern Conference's two toughest-remaining schedules in regard to cumulative opponent winning percentage. The ninth-place Miami Heat could be getting Goran Dragic back from a two-month absence and the 10th-place Orlando Magic went into the break by winning seven of their last eight games. So things could get interesting, even if this isn't the most inspiring group of playoff contenders. And the last night of the season will include two games -- Miami at Brooklyn and Orlando at Charlotte -- within the group. The Nets actually have six rest-advantage games remaining (most in the East), and they'll have a rest advantage in three of their five remaining games within this group. The Nets have a brutal final month of the season. From March 13-28, they're on a seven-game trip, with the first six games against six of the top 10 teams in the Western Conference and the finale in Philadelphia. They then come home to play the Celtics, Bucks and Raptors before heading out for a back-to-back in Milwaukee and Indiana. They do have a rest advantage when they close the season at home against the Heat. The Hornets have the East's toughest remaining schedule in regard to cumulative opponent winning percentage, with 14 of their final 25 games against teams that currently have winning records. That includes both of their games against the Warriors and five games against the top five teams in the East. They also have just one game against a team playing the second game of a back-to-back (tied for the fewest in the league -- and that one is in Houston) and five rest-disadvantage games (tied for most in the league). The Hornets do have some tiebreaker advantages in that they're currently 7-1 against the three teams behind them in the standings and still have the opportunity to win the season series with Brooklyn. The Pistons have the most road games left in the East, in part because Detroit and Miami are the only teams in the league with 26 games left on their schedule. They'll play 15 of the 26 on the road, with no more homestands longer than two games. Their six remaining back-to-backs are also the most for any Eastern Conference team. As noted above, the Heat still have 26 games left to play. They'll have 14 of the 26 at home, and the time to make their move will be right after they visit the Sixers on Thursday. After that game, they'll play 10 of their next 12 games at AmericanAirlines Arena, a stretch that includes five games against the Pistons (both at home), Nets (one at home) and Hornets (one at home and one on the road). Of course, the Heat are just 11-16 at home this season, having lost their last four games at the Heat's House. The Magic have the East's second-easiest remaining schedule in regard to cumulative opponent winning percentage. And it includes eight games against the five teams below them in the Eastern Conference standings.